See the difference proper care and cleaning of your teeth can make during your Orthodontic treatments with Dr. Shinmachi. For further assistance, please call our office at Mint Orthodontics Somerville Orthodontic Office Phone Number (908) 526-0808 or use our Message form. 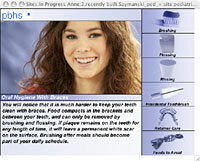 Oral Hygiene Video | Brush After Meals | Tooth Flossing with Braces | Hygiene Results!